South Carolina officials say a statewide auditing system has produced a 92 percent compliance rate with the state’s ban on hiring illegal immigrants. Arizona has no auditing system and the state’s ‘tough’ law on hiring has produced three small cases in three years. COLUMBIA, S.C. — Arizona might learn something from South Carolina about how to deal with employers who hire illegal immigrants. Arizona officials make a lot of headlines but have done little to enforce the state’s ban on businesses employing the undocumented. Only three businesses — all in the Phoenix area — have been prosecuted in the nearly three years since Arizona’s much-touted “employer sanctions” law has been in effect. None have been permanently shut down by prosecutors, which is possible under the law. In Arizona’s 14 other counties, state funding has been pulled because there has been no enforcement of the law. By contrast, South Carolina officials make few headlines on immigration but have put into place a law and auditing system that supporters say has drastically reduced the number of illegal immigrants who are hired in their state. They claim that among large businesses there is 92 percent compliance with the law’s requirement to use the federal E-Verify system to ensure workers are in the country legally. South Carolina has cited nearly 150 businesses for being out of compliance since the law was enacted in 2009. The state law aimed at stopping the hiring of undocumented workers in Arizona is known as the Legal Arizona Worker Act (LAWA), or “employer sanctions” law, and is touted as one of the toughest in the nation. It is currently under review by the U.S. Supreme Court because opponents say it illegally encroaches on federal authority. Opponents include civil rights advocates and business organizations. Under the law, businesses that knowingly or intentionally hire unauthorized workers can have their licenses suspended or revoked, putting them out of business. The law also says businesses must use E-Verify, the federal system for checking workers’ legal status. But no system is in place in Arizona to confirm the use of E-Verify, and no statewide monitoring or auditing system exists. Instead, local prosecuting attorneys take complaints and attempt to build individual cases. As the numbers show, they’ve made little effort and have had almost no success. The Arizona legislature passed The Legal Arizona Worker Act was in 2007 and it took effect on Jan. 1, 2008. Its passage ignited some apprehension in the state, particularly concerning the use of the federal E-Verify system. But the law was implemented and survived two challenges in federal district and appeals court. The Supreme Court case will be its last stop on the legal ladder. But so far the state has failed to execute a single business. In fact, only three prosecutions have been made under the law. All were in Maricopa County, which also receives the most amount of funding to enforce the law – $3.6 million since the law was enacted. One prosecution involved a water park business, “Waterworld,” that had already shut down before its license could be suspended. Another was against the Scottsdale Art Factory, a custom furniture maker whose owners are fighting prosecution in the court system. The third was a Phoenix Subway sandwich shop owner who was referred to the Maricopa County Attorney’s Office by the federal Immigration and Customs Enforcement agency. The shop had been informed by federal officials that one of its employees did not have legal status. The business fired the worker but hired him back under a false identity. In addition to a $400 federal fine, the business had its license suspended for two days and it has to serve three years of probation. The Pew Hispanic Center, a nonpartisan research institute, estimates that 94 percent of male illegal immigrants find jobs in the United States. In 2008, Pew estimated that there were 300,000 illegal immigrants working in Arizona. As of July, the Arizona Corporation Commission records show that there are more than 630,000 licensed businesses operating in the state. According to the Arizona Attorney’s General Office, there are only 33,000 users of E-Verify, the employee verification system that is mandatory for all businesses under state law. These numbers indicate that Arizona employers are not complying with E-Verify requirements and are hiring illegal immigrants and getting away with it. Some local officials say that despite the national focus on Arizona’s law to arrest illegal immigrants there have been very few local complaints lodged against those who employ them. Apache County Attorney Michael Whiting has not received any tips other than a letter over the summer from a person who said illegal workers were taking job opportunities away from legal residents. He said the lack of public awareness and education are part of the reason his county has not received more response from the citizens. Greenlee County Attorney Derek Rapier says people in his county don’t seem to be concerned. In Mohave County, 25 citizen tips have been presented but none of them resulted in fines. Yuma County has received a total of two complaints. Jon R. Smith, the Yuma County attorney, says there is not much interest in or support for investigating employer sanctions cases at the local level. He suggests a statewide enforcement system would be more effective and consistent. “[I]t was difficult in the beginning to see how that would be more beneficial at the county level versus at the state level,” Smith said. Supporters of the employer sanctions law say it is missing a key component to ensure county attorneys are actually able to prosecute businesses that break the law: the ability to subpoena business records. “It’s very difficult often times to prosecute cases under this particular statute and one of the reasons for the difficulty is that the Legislature in their wisdom determined not to afford subpoena power to investigators so that they would be able to compel the production of documents,” said Barnett Lotstein, a former Maricopa County prosecutor. State Rep. John Kavanagh supports the employer sanctions law and would like to grant subpoena power to prosecutors. But he says the business community, represented by the local and state chambers of commerce, has successfully dissuaded the legislature from granting subpoena power. During the last session, legislators were once again a few votes short of passing a bill to give local prosecutors subpoena power. Kavanagh said a lot of members were convinced by business interests to vote no. He said supporters would continue to bring the issue up in the legislature. In spite of the very low prosecution numbers, the law’s supporters say it has had a positive effect. “After its passage a number of indirect reports came in that illegal immigrants have been leaving Arizona,” Kavanagh said. “While I like to think they’re going back to their home countries, my suspicion is that they’re relocating to other U.S. states, but that still reduces the problem in Arizona.” Rep. Kavanagh lives in Fountain Hills, Ariz., and says he has directly seen the impact of the employer sanctions law in the area. But Kavanagh said the poor economy may also be to blame for decreasing immigrant populations in the state. “Clearly the major reason why there’s a great decrease in the illegal immigration population is the economy, but the employer sanctions law has also taken its toll on these illegal aliens,” he said. Even Maricopa County Sheriff Joe Arpaio, the self-styled “Toughest Sheriff in America,” has had trouble busting violators under the employer sanctions law. Arpaio’s office has conducted 88 investigations under the Legal Arizona Workers Act that were either completed or closed without action, according to the Maricopa County Attorney’s Office. As of May, the sheriff’s office has 16 investigations open. In Maricopa County, the sheriff’s office has traditionally received the lion’s share of funding allocated to the counties for the enforcement of the employer sanctions law. But when Arpaio’s political ally, County Attorney Andrew Thomas, stepped down to run for attorney general, the new interim county attorney, Rick Romley, changed the funding plan and the county’s entire enforcement approach. Romley announced in a news release on July 1 that the $1.2 million allocated to his office annually to enforce the employer sanctions law would be used to coordinate investigations with all the law enforcement departments in his county that are willing to be involved. He also said that law enforcement would concentrate on education and individual investigations of violators instead of workplace raids preferred by Arpaio. Romley further said that his office would reallocate $700,000 the sheriff’s office previously received for the raids. During the raids, employees of a particular business are usually detained and asked about their immigration status. Critics of the raids have said they target the workers while letting business owners off the hook. Arpaio is facing an investigation by the U.S. Justice Department, which is looking into whether his officers have racially profiled the people they detained and whether they have illegally detained citizens or legal residents. Romley, who served as county attorney from 1989 to 2004 and was re-appointed to the office by the Maricopa County Board of Supervisors after Thomas stepped down to run for attorney general, has often clashed with Arpaio. Romley is now running for re-election as County Attorney. It would be his fifth term. Arpaio’s office responded by accusing Romley of playing politics and claimed that its raids had resulted in 415 total arrests and 277 people being charged with identity theft. There are no political fights over employer sanctions money in Arizona’s other 14 counties because their funding has been removed due to lack of action. In South Carolina, the Illegal Immigration Reform Act took effect in 2009. It was aimed at halting the hiring of illegal immigrants. Randy Austin, founder & president of Austin International in South Carolina shares his opinion on employer sanctions laws. The law states that all businesses in South Carolina must verify the legal status of their employees by using the federal E-Verify system or through verification of a driver’s license from a state that only issues licenses to legal residents. These verifications must take place within five days of the hire. The law was phased in over two years. Large businesses, those with 100 or more employees had to comply with the law by July 1, 2009. Those with fewer than 100 employees had to comply by July 1, 2010. Penalties include fines of up to $1,000 for each violation and possible revocation of the business license. In 2009, the state Department of Labor, Licensing and Regulation, which is in charge of enforcing the law, began auditing the companies with 100 employees or more to make sure they were following the law’s requirements. The department concentrated on up-front enforcement. The department also launched an education and information campaign shortly after the law’s passage and the audits were announced ahead of time. The department found that the state had an overall 92 percent compliance rate among the larger companies, meaning they were using the E-Verify system to weed out illegal workers. As of July 2010 1,750 audits out of 2,300 had been completed of the large companies in the state. Nearly 150 of those businesses were issued citations; the majority of those were cited for failing to verify the status of their new hires within the five-day period. Renee Artigues, officer manager of Pleasant Places in South Carolina, shares the experience of the company being audited and her opinions on employer sanctions. Jim Knight, spokesman for Labor, Licensing and Regulation says it is a common problem. “Typically what we’ll find is that an HR person who has responsibility for doing the e-verifications, he or she gets busy, gets distracted and they take two weeks, two months, three or four months before they get around to verifying that new hire,” Knight said. Once a citation is given, the business has 72 hours to correct any problems or it faces fines up to $1,000 per violation of the law. Unauthorized workers are supposed to be fired immediately. The new law made a stickler out of Randy Austin, the president and CEO of Austin International, a York, S.C. based company with 150 employees. 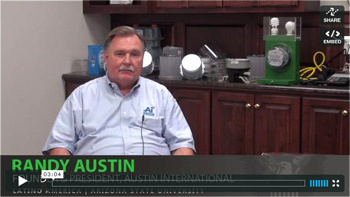 Austin’s business makes meters and other devices for utility companies. Before the state law was implemented the federal Social Security Administration would send Austin a letter each year, listing those employees whose names did not match their Social Security numbers. Austin would send memos telling the employees in question that they needed to get their information corrected but said he did not worry much about it because there was no real enforcement at that time. He did attempt phase out the employees in question as they left to take other jobs. Renee Artigues, office manager of Pleasant Places in South Carolina, shows you the step-by-step process of verifying an new employee’s work status through the federal program known as E-Verify. One day in November 2009 state auditors showed up at Austin International. They gave the company an $850 fine after finding an employee whose name did not match his Social Security number. Like all business owners, Austin was given the opportunity to verify the employee’s status and to begin using the E-Verify system. The employee chose to leave the business and Austin implemented E-Verify. The fine was waived. Before he made the switch to E-Verify, Austin says his company used to get 25 to 50 Spanish speakers coming in weekly looking for a job. Now it gets none. South Carolina has cited businesses first for violating the five-day verification rule, giving them a chance to terminate any illegal employees. In nearly two years, the agency has only fined one company for “knowingly” hiring unauthorized workers. After two audits and thousands of dollars in fines, one could say Renee Artigues is an employer sanctions expert. She and her husband Guy own Pleasant Places, a large landscaping company in Mount Pleasant, S.C., that has been in business since 1984. It originally began as a push-mower service when Guy was only 18 years old but has since transformed into a thriving company. A state audit revealed that 24 of Pleasant Places’ workers were not authorized for employment. One employee who was discovered during a first audit was still employed after auditors returned for a follow up. The department accused Pleasant Places of purposely violating the law. Under a settlement agreement the business paid $11,500 in fines and received a 10-day suspension of its business license. To help her husband, Renee stepped in and took over an office scattered with piles of paperwork and personnel folders. Everything was a mess and numerous terminations had taken place. As the new office manager, she educated herself on the employer sanctions process in order to sort out the disorder and make sure the company was in compliance with the state law. “Anyone who did not have [employee paperwork] completely and correctly filled out, I went through personally every single file folder and straightened that out,” Artigues said. “If you did not have confirmation that you were a U.S. citizen, I had to unfortunately terminate.” Artigues believes that the easiest way to make sure everybody is legal and fine is to use the E-Verify system. “This has proven to be the most reliable and the easiest method for us,” she said. “It saves trying to decide if a green card is real, if a green card is not. It saves you all the trouble and puts the burden back onto the government to prove that it’s OK.” Pleasant Places posted E-Verify signs in English and Spanish to make sure all interested workers are aware that their legal status will be verified. Aritigues says she’s had people hand back the application after seeing the signs. For Artigues, the combination of state and federal requirements can become a bit confusing and tricky. State Sen. Larry Martin, a Republican who helped draft South Carolina’s law, said he hasn’t heard from any business owner saying the requirements are difficult to meet or that any alterations are necessary. He would like to see Congress pass a bill that would make the use of E-Verify mandatory for all states. He acknowledged, however, that a federal law would be difficult to enforce on all businesses. “It’s going to be hard for the federal government to enforce a law if there’s not something corresponding at the state level that will add competence to compliance if you will of the state requirements,” he said. In an attempt to prevent a low compliance rate, South Carolina’s Labor Licensing and Regulation officials traveled the state to educate business organizations and offered an online training program before the audits began to ensure employers were familiar with the law and its requirements. State officials are particularly concerned about small businesses, which they are just beginning to audit this year. Because of the large number of small businesses and because they are less likely to verify worker status, the LLR does not expect a compliance rate above 90 percent, as it had for the large businesses. According to Knight, the LLR spokesman, the department might not be able to audit every business in the state or every hire at every business, due to lack of funding for such a broad effort. So the agency will go after businesses that hire the most immigrants. South Carolina’s largest immigrant group is Latinos. According to the Consortium for Latino Immigration Studies in the Arnold School of Public Health at the University of South Carolina, most of the Latino workforce in the state is found in the construction, manufacturing, food-processing, service, and agricultural industries. Knight says his agency is focusing on industries that attract immigrants, and not concentrating on a particular race or ethnic group. “If there are 70 new hires, our investigators are told… pick a number and you’ll go every 10th worker or you’ll go every sixth worker, so that if it’s Jones, if it’s Smith, if it’s Gonzales … we’re not focusing on one particular group of employees, we’re not focusing on names, we’re not focusing on country of birth, we’re not focusing on state or city or county because as I tell folks, the South Carolina law does not discriminate,” Knight said. For some immigrant advocates, like Tammy Besherse, discrimination based on accents or appearance is a concern. A report released by the U.S. Department of Homeland Security in December 2009 says the E-Verify program is 96 percent accurate. However, the report said that foreign-born workers who are authorized to work in the United States are 20 times more likely than other workers to receive a “tentative non-compliance” from the system, meaning they are not cleared to work and must go to the Social Security Administration and U.S. Citizenship and Immigration Service to prove their legal work status. The report also found that the system catches less than half of those who obtain a Social Security number through identity theft. Besherse believes individual businesses and state law enforcement will make mistakes implementing and enforcing the state law. She would rather leave it up to the federal government to enforce employer sanctions laws. But Martin is pleased with the law and its enforcement and believes South Carolina is doing the right thing. “It’s been very successful and is something that we believe that is essential toward addressing the illegal immigration problem in our state,” he said. There are laws on the books that make hiring illegal immigrants a federal offense. But federal prosecutions usually involve large cases or enforcement aimed at individuals who are caught up in other federal violations. Supporters of employer sanctions laws in states like Arizona and South Carolina say the states must step in or there will be no enforcement on hiring illegal immigrants. Opponents of such laws cite the potential for discrimination or the legitimate need for workers as their top concerns. The U.S. Chamber of Commerce and state chambers of commerce nationwide have called for comprehensive immigration reform that includes guest worker programs so businesses can find the employees they need. “Only the federal government can pull this one off, and until the federal government gets its act together and does this you’re going to have states like Arizona passing all sorts of different laws, which will create a crazy quilt patchwork of laws across America that will make it very difficult for businesses to comply with all these different rules and laws,” said Glenn Hamer, president and CEO of the Arizona Chamber of Commerce and Industry. Guest worker programs have come and gone in this nation of immigrants. Most notably the Bracero Program, which was developed in 1942 due to a need for agricultural laborers during World War II. It gave temporary legal employment opportunities in the United States to workers from Mexico. The program ran until 1964 and from employers’ perspectives was a success, but it was frequently beset controversy, mainly over how workers were treated. Hamer argues the oft-repeated argument that immigrants are taking jobs from American workers is a canard. “Even in this very difficult economy we still have not noticed thousands of people leaving the Phoenix area to go to Yuma to pick lettuce and to do other types of agricultural jobs,” he said. Hamer said the country needs a way to bring workers here legally to do jobs “that American workers just simply won’t do.” Some of Arizona’s lawmakers have taken tours to rural Yuma County in southwestern Arizona to consider the need for a guest worker program to support the county’s large agricultural operations. State Rep. John Kavanagh took one of the tours and says he supports guest worker programs as long as they are handled in an organized manner that divides the workers’ time between the U.S. and their home countries. But in his July speech on immigration, President Barack Obama recognized the fact that many illegal immigrants have already established their families within the United States.